The National Archives (TNA) is a non-ministerial government department. Its parent department is the Department for Digital, Culture, Media and Sport of the United Kingdom of Great Britain and Northern Ireland. It is the official archive of the UK government and for England and Wales; and "guardian of some of the nation's most iconic documents, dating back more than 1,000 years." There are separate national archives for Scotland (the National Records of Scotland) and Northern Ireland (the Public Record Office of Northern Ireland). 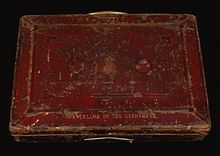 TNA was formerly four separate organisations: the Public Record Office (PRO), the Historical Manuscripts Commission, the Office of Public Sector Information (OPSI) and Her Majesty's Stationery Office (HMSO). The Public Record Office still exists as a legal entity, as the enabling legislation has not been modified, and documents held by the institution thus continue to be cited by many scholars as part of the PRO. Since 2008, TNA has also hosted the former UK Statute Law Database, now known as legislation.gov.uk. It is institutional policy to include the definite article, with an initial capital letter, in its name (hence "The National Archives", abbreviated as TNA) but this practice is not always followed in the non-specialist media. The National Archives is based in Kew in the London Borough of Richmond upon Thames in south-west London. The building was opened in 1977 as an additional home for the public records, which were held in a building on Chancery Lane. The site was originally a World War I hospital, which was later used by several government departments. It is near to Kew Gardens Underground station. Until its closure in March 2008, the Family Records Centre in Islington was run jointly by The National Archives and the General Register Office. The National Archives has an additional office in Norwich, which is primarily for former OPSI staff. There is also an additional record storage facility (DeepStore) in the worked-out parts of Winsford Rock Salt Mine, Winsford, Cheshire. For earlier history, see Public Record Office. The National Archives was created in 2003 by combining the Public Record Office and the Historical Manuscripts Commission and is a non-ministerial department reporting to the Minister of State for digital policy. On 31 October 2006, The National Archives merged with the Office of Public Sector Information (OPSI), which itself also contained Her Majesty's Stationery Office (HMSO) which was previously a part of the Cabinet Office. The name remained The National Archives. Regulation – ensuring that other public sector organisations adhere to both the public records act and the PSI reuse regulations. The National Archives (and before it the Public Record Office) has long had a role of oversight and leadership for the entire archives sector and archives profession in the UK, including local government and non-governmental archives. Under the Public Records Act 1958 it is responsible for overseeing the appropriate custody of certain non-governmental public records in England and Wales. Under the 2003 Historical Manuscripts Commission Warrant it has responsibility for investigating and reporting on non-governmental records and archives of all kinds throughout the United Kingdom. In October 2011, when the Museums, Libraries and Archives Council was wound up, TNA took over its responsibilities in respect of archives in England, including providing information and advice to ministers on archives policy. The National Archives now sees this part of its role as being "to enhance the 'archival health of the nation'". Entrance gates to The National Archives from Ruskin Avenue: the notched vertical elements were inspired by medieval tally sticks. Service and operational records of the armed forces War Office, Admiralty etc. There is also a museum, which displays key documents such as Domesday Book and has exhibitions on various topics using material from the collections. The collections held by the National Archives can be searched using their online catalogue. Entrance to The National Archives is free. Anybody aged 16 or over can access the original documents at the Kew site, after producing two acceptable proofs of identity and being issued a free reader's ticket. The reading room has terminals from which documents can be ordered up from secure storage areas by their reference number. The reference number is composed of three sections: the department code of up to four letters, such as WO for the War Office; a series or class number, for the "subcategory" or collection that the document comes from; and an individual document number. Documents can also be ordered in advance. Once a document has been ordered, The National Archives aims to get it to the reader within 45 minutes (assuming it is kept at Kew rather than at their second repository, "Deep Store" – a former salt mine in Cheshire: it can take 2–3 days for files to be retrieved from the latter). Special arrangements are in place for readers wishing to retrieve large groups of files. A reader's ticket is not needed to access records on microform or online. Frequently accessed documents such as the Abdication Papers have been put on microfilm, as have records for two million First World War soldiers. The originals of the latter were stored in a warehouse in London along with four million others, but incendiary bombs dropped on the warehouse in the Second World War started a fire in which most were destroyed. The surviving third were largely water or fire-damaged and thus acquired the colloquial name of the "Burnt Documents." Because they were mostly too fragile for public access, they were put on microfilm with the aid of the Heritage Lottery Fund. They have now also been digitised and are available on the Ancestry website. Some of the most popular documents have now been digitised and are available to download from Discovery, for a fee of £3.50 per file, or through co-branded services called licensed Internet associates (LIA) as pay per view or part of their subscription service. A list of records online is available under the records, catalogues and online records menu on The National Archives' website. All of the open census records have been digitised, and there are also significant other sources online, such as wills proved in the Prerogative Court of Canterbury, 1383–1858. Researchers are encouraged to check the online services first, to see if they can get what they want online. If a document is available online, The National Archives' policy is to encourage people to use the digital copy and not the original, even if they come to Kew, in order to protect the original from damage. The documents are stored on mobile shelving – double-sided shelves, which are pushed together so that there is no aisle between them. A large handle on the end of each shelf allows them to be moved along tracks in the floor to create an aisle when needed. They are generally stored in acid-free folders or boxes. In the event of a fire The National Archives would be clearly unable to use sprinklers for fear of ruining its holdings, and so when the building is evacuated, argon gas is released into the air-tight repositories. The National Archives also provides services to help users in their research and also find collections beyond those it holds. National Archives at the London University School of Advanced Studies History Day, November 2015. The National Archives' education web page is a free online resource for teaching and learning history, aimed at teachers and students. Users can select time periods they are interested in, from the medieval era to the present day. Each time period contains sub-topics with various materials that can be used as teaching tools for teachers. Resources for students focus primarily on tips for research and writing using archival materials. Access to Archives (also known as A2A) is a database containing details of archival collections held in many different archive repositories in England and Wales. As of March 2008, there are no more plans to add additional collections to A2A due to lack of funding from the Heritage Lottery Fund and the changing financial priorities of The National Archives, but existing entries can still be updated. The A2A database was transferred to The National Archives with a new platform with a simpler interface to ensure its availability. The National Register of Archives (NRA) is the central point for the collection and circulation of information about the content and nature of archival manuscripts relating to British history. It contains published and unpublished lists and catalogues describing archival collections in the UK and overseas: currently over 44,000 such catalogues are included. The register can be consulted in the National Archives reading room and the index used to be searchable as an online database on the National Archives web site. The information is collected in a variety of ways. TNA is sent hard-copy catalogues from archive repositories holding records relating to British history. These are kept in the reading room at The National Archives and indexed in the online database. TNA conducts an annual survey of archive repositories and records all new accessions, and the accession lists are also available on TNA's website. Information is also obtained from surveys and guides to archival collections, and other publications. The Register includes name indexes to its contents (covering corporate names, personal names, family names, and place names); but not subject or thematic indexes. Where the catalogues are themselves available online the indexes provide direct electronic links; but many still exist in hard copy only (often as unpublished "grey literature"), and it remains necessary for the researcher to visit either TNA or the specific repository in order to consult them. A separate National Register of Archives for Scotland is maintained at the National Archives of Scotland, but its contents are duplicated within the NRA at Kew. ARCHON Directory is a database of contact details for archive repositories in the UK and institutions elsewhere in the world which have substantial collections of manuscripts relating to British history. Your Archives is a wiki for the National Archives on-line community which was launched in May 2007; it was closed for editing on 30 September 2012 in preparation of archiving on the Government web archive. The contributions are made by users to give additional information to that which is available on the other services provided by the National Archives, including the catalogue, research guides, documentonline and National Register of Archive. Your Archives encourages users to create articles not only about historical records held by the National Archives, but those held in other archive repositories. The National Archives also hosts several databases on types of records including hospital records; migration records; and manorial records. Working with the Wellcome Library, TNA has made hospital records available via the Hospital Records Database. The Hospital Records Database has not been updated since 2012, and there are no current updates occurring as of 2018. The Manorial Documents Register includes records relating to manors located in England and Wales. Digitization of the records is on-going as of 2018. The National Archives operates the Civil Pages project on behalf of the Cabinet Office, operating as an online directory for the civil service, facilitating working together and providing a means of sharing knowledge securely between government departments. In January 2011 The National Archives, in conjunction with historian Nick Barratt and smartphone applications development studio RevelMob, developed its first Old Money iPhone app, which uses historic price data from documents held at The National Archives to see what a sum of money from the past (from 1270) would be worth today and the spending power it would have commanded at the time. In September 2011, TNA's museum began using QRpedia codes, which can be scanned by smartphone users in order to retrieve information about exhibits from Wikipedia. TNA regularly posts blogs to its website. Posts cover a wide range of topics, from specific events and time periods to features on holdings in TNA, as well as information on the archive's operations. The "Archives Media Player" section holds videos and podcasts created and posted by TNA. Videos and audio are not posted as regularly as TNA's blog. Archives Inspire is a strategy document that sets out the goals and priorities of the organisation over four years, from 2015 onwards. In June 2005, journalist Ben Fenton of The Daily Telegraph received an email from a colleague asking him to investigate documents held at TNA that alleged that a British intelligence agent had, on the orders of Winston Churchill, murdered Heinrich Himmler, the head of the Nazi SS, in 1945. The three documents had come to prominence after being revealed by author Martin Allen in his book Himmler's Secret War. On viewing photographs of the documents, Fenton's suspicions were immediately aroused by the fact that such a controversial policy was casually committed to paper, even to the extent of naming the assassin, and by the use of colourful language, unlike the civil service language of the 1940s used by senior Foreign Office officials John Wheeler-Bennett and Robert Bruce Lockhart. Viewing the original documents the next day, Fenton spotted what looked like pencil marks beneath the signature on one of them. This confirmed his suspicions and, along with his experience of analysing historic documents, it enabled him to persuade The Daily Telegraph to pay for forensic analysis. TNA staff took four files, along with authenticated copies of the authors' handwriting, to Dr Audrey Giles, a former head of Scotland Yard's Questioned Documents Unit where she confirmed that the documents were certainly forgeries. One letter head had been printed on a laser printer, the earliest example of which was produced in 1977, and all had tear marks where they had been threaded on to the security tags. Further investigations by TNA staff revealed that the counterfeit documents contained errors, breaches of protocol and etiquette which their supposed authors would not have committed, prompting one expert to state that the inconsistencies in the papers "would lead any serious historian to question their veracity". After his account of the deception appeared in the newspaper, Fenton was contacted by a German academic, Ernst Haiger, who informed him of his own suspicions over other TNA documents cited in an earlier Allen book. Examination by TNA experts led to more than a dozen documents being identified as suspicious and submitted to Home Office specialists for examination. When they, too, were declared forgeries, the TNA called in the police. In the addendum to the later American edition of the book (which acknowledged that the papers were forged), Allen theorised that, some time after he saw the documents, they had been removed and replaced with clumsily forged replicas, to cast doubt upon his discoveries. In all, twenty-nine forged documents were discovered, each typed on one of only four typewriters. They were placed in twelve separate files, and cited at least once in one or more of Allen's three books. According to the experts at TNA, documents now shown to be forgeries supported controversial arguments central to each of Allen's books: in Hidden Agenda, five documents now known to be forged helped justify his claim that the Duke of Windsor betrayed military secrets to Hitler; in The Hitler/Hess Deception, thirteen forged papers supported Allen's contention that, in 1941, British intelligence used members of the Royal Family to fool the Nazis into thinking Britain was on the verge of a pro-German putsch; in Himmler's Secret War, twenty-two counterfeit papers also underpinned the book's core claims that British intelligence played mind games with Himmler to encourage him to betray Hitler from 1943 onwards, and that ultimately they murdered the SS chief. In 2007 the Crown Prosecution Service announced that it was "not in the public interest" to prosecute the only suspect questioned by police. Allen's health problems had prevented the police questioning him for nine months, after which he told them he was wholly innocent. In a December 2007 response to questions from Norman Baker MP, the Solicitor-General said that the police investigation, guided by the opinion of a senior barrister, had produced "sufficient evidence for a realistic prospect of conviction" on charges of forgery, using a forged document and criminal damage but it had been decided that it was not in the public interest to proceed. In reaching that decision, "matters relating to Mr Allen's health and the surrounding circumstances were significant in deciding that a prosecution was not in the public interest". It is hard to imagine actions more damaging to the cause of preserving the nation's heritage, than wilfully forging documents designed to alter our historical record. TNA receives records from MI5 around twice a year. Some information in records—or records themselves—are withheld at the discretion of MI5. MI5 records relating to British Prime Minister Margaret Thatcher's time in office have caused some questions and controversy regarding the transparency of the British government. In 2017, journalist Richard Norton-Taylor argued that MI5, and the British government by extension, was purposely withholding some information that the public deserves to know. Norton-Taylor specifically refers to Thatcher's reluctance to allow the publication of two books looking into the impact that intelligence organizations of Britain had on World War II, as well as her worries about British activities in Northern Ireland becoming known to the general public. Additional MI5 records relating to the blacklisting of government workers during Thatcher's time in office have also prompted questions after their release. In addition to government workers, the blacklists also targeted other groups, such as unions and minorities, that may not fall in line with conservative policies. Debates on the roles of MI5, Whitehall, and Thatcher's administration, have come up in light of these records at TNA and prompted questions of transparency as well as whether or not these blacklists had an effect on the careers of any individuals included. Questions also remain, as of 2018, whether or not there are still blacklists currently in effect and if these could affect government workers, unions, and other individuals possibly included in the blacklists. ^ "The National Archives". UK Government. Archived from the original on 14 September 2016. Retrieved 22 August 2016. ^ "Machinery of Government changes: Data protection policy; Information Commissioner's Office; The National Archives; and, Government records management policy:Written statement – HCWS209". Inside Government. parliament.uk. 2015. Archived from the original on 30 September 2015. Retrieved 12 October 2015. ^ http://www.gov.uk Archived 29 November 2015 at the Wayback Machine." "Archived copy". Archived from the original on 25 January 2013. Retrieved 5 February 2013. CS1 maint: Archived copy as title (link)". Retrieved 22 August 2016. ^ "Freedom of Information Act 2000". www.legislation.gov.uk. Archived from the original on 12 June 2017. Retrieved 15 June 2017. ^ "Public Records Act 1958". www.legislation.gov.uk. Archived from the original on 18 May 2017. Retrieved 15 June 2017. ^ "General Instructions: The Library". academic.oup.com. Archived from the original on 3 June 2017. Retrieved 15 June 2017. ^ "The opening of the Public Record Office in Kew in 1977". Your Archives. The National Archives. Retrieved 5 July 2007. ^ "Home". Deepstore. Archived from the original on 4 October 2011. Retrieved 1 February 2011. ^ "New role for Chief Executive". The National Archives. Archived from the original on 5 September 2015. Retrieved 28 August 2015. ^ "Appointment of Chief Executive and Keeper". The National Archives. Archived from the original on 5 September 2015. Retrieved 28 August 2015. ^ "About Us, About us". The National Archives. Archived from the original on 9 May 2008. Retrieved 5 July 2007. ^ "Public Records Act 1958". The National Archives. Archived from the original on 2 October 2013. Retrieved 26 May 2013. ^ "HMC Warrant". The National Archives. Archived from the original on 12 June 2011. Retrieved 26 May 2013. ^ Kingsley, Nick (2012). "Perspectives and Priorities: The National Archives Vision for Sector Leadership". Journal of the Society of Archivists. 33: 135–47. doi:10.1080/00379816.2012.721344. ^ "Who we are, what we do and how we operate". The National Archives. Archived from the original on 12 July 2008. Retrieved 5 July 2008. ^ "Visit us, Museum". The National Archives. Archived from the original on 26 May 2010. Retrieved 9 June 2010. ^ "Detecting your browser settings". Nationalarchives.gov.uk. Retrieved 1 February 2011. ^ "Visit us, Why visit us?". The National Archives. Archived from the original on 10 July 2008. Retrieved 10 July 2008. ^ "Visit us, Registering for a readers ticket". The National Archives. Archived from the original on 20 November 2007. Retrieved 10 July 2008. ^ "Visit us, Ordering documents in advance". The National Archives. Archived from the original on 20 November 2007. Retrieved 10 July 2008. ^ "Family Tree, Genealogy and Census Records". Ancestry.co.uk. Archived from the original on 12 November 2015. Retrieved 1 February 2011. ^ "The National Archives, Discovery". The National Archives. Archived from the original on 20 May 2011. Retrieved 23 November 2012. ^ "The National Archives, Licensed Internet Associates". The National Archives. Archived from the original on 30 October 2012. Retrieved 23 November 2012. ^ "The National Archives, online records". The National Archives. Archived from the original on 30 October 2012. Retrieved 23 November 2012. ^ "Education". The National Archives. Archived from the original on 2 February 2011. Retrieved 1 February 2011. ^ Archives, The National. "Education - The National Archives". The National Archives. Retrieved 10 November 2018. ^ "Access to Archives". The National Archives. Archived from the original on 2 February 2011. Retrieved 1 February 2011. ^ "The National Archives – Access to Archives". Archived from the original on 8 July 2008. Retrieved 4 July 2008. ^ "Archives Hub Steering Committee meeting, 1 November 2007, University of Manchester". Archives Hub. 1 November 2007. Archived from the original on 29 September 2008. Retrieved 5 July 2008. ^ "A2A – Access to Archives home". Archived from the original on 28 July 2008. Retrieved 5 July 2008. ^ "Discovery – The National Archives". nationalarchives.gov.uk. Archived from the original on 4 August 2007. ^ a b c d The National Archives. "National Register of Archives". Archived from the original on 4 August 2007. Retrieved 5 July 2007. ^ The National Archives. "National Register of Archives: Frequently asked questions". Archived from the original on 16 January 2013. Retrieved 20 January 2013. ^ "Search Other Archives | Accessions to Repositories". The National Archives. Archived from the original on 2 February 2011. Retrieved 1 February 2011. ^ "The National Archives – The ARCHON Directory". The National Archives. Archived from the original on 29 June 2007. Retrieved 5 July 2007. ^ "Your Archives". yourarchives.nationalarchives.gov.uk. Archived from the original on 17 August 2013. Retrieved 8 May 2018. ^ The National Archives (14 May 2007). "Your Archives". The National Archives. Archived from the original on 7 June 2007. Retrieved 5 July 2007. ^ "Your Archives". The National Archives. Retrieved 5 July 2007. ^ "Your Archives: What can I contribute?". The National Archives. Retrieved 5 July 2007. ^ "Catalogues and online records". The National Archives. Retrieved 1 February 2011. ^ "migration". Nationalarchives.gov.uk. Retrieved 1 February 2011. ^ "Manorial Documents Register | Welcome". The National Archives. Archived from the original on 2 February 2011. Retrieved 1 February 2011. ^ "The National Archives – Search the archives". Retrieved 4 July 2008. ^ "The National Archives | Hospital Records Database | Welcome". www.nationalarchives.gov.uk. Retrieved 15 November 2018. ^ Archives, The National. "Manorial Documents Register - The National Archives". Archives sector. Retrieved 15 November 2018. ^ "The National Archives Annual Report and Resource Accounts 2008–2009 HC 469" (PDF). Archived (PDF) from the original on 2 March 2011. Retrieved 1 February 2011. ^ "www.revelmob.com | Revel Mob – developing best-selling smartphone apps". Revel Mob. Archived from the original on 28 January 2011. Retrieved 1 February 2011. ^ "Old Money". www.revelmob.com. Archived from the original on 22 January 2011. Retrieved 1 February 2011. ^ "Old Money iPhone app launched using records from The National Archives". www.revelmob.com. Archived from the original on 25 January 2011. Retrieved 1 February 2011. ^ "New collaboration between Wikimedia UK and The National Archives". The National Archives (United Kingdom). 15 September 2011. Archived from the original on 26 August 2012. Retrieved 16 September 2011. ^ Archives, The National. "Blogposts | The National Archives Blog". The National Archives blog. Retrieved 18 November 2018. ^ Archives, The National. "Home - Archives Media Player". Archives Media Player. Retrieved 18 November 2018. ^ Archives, The National. "Archives inspire - The National Archives". nationalarchives.gov.uk. Archived from the original on 9 December 2017. Retrieved 8 May 2018. ^ a b c d e f g h i Fenton, Ben (3 May 2008). "Lies and secrets". Financial Times. Archived from the original on 6 May 2008. ^ a b Fenton, Ben (3 May 2008). "Himmler forgeries in National Archives case will stay unsolved". Financial Times. Archived from the original on 6 May 2015. Retrieved 1 February 2011. ^ "MI5 At The National Archives | MI5 - The Security Service". www.mi5.gov.uk. Retrieved 25 November 2018. ^ Norton-Taylor, Richard (29 December 2017). "For their eyes only: the secret stories ministers don't want you to read | Richard Norton-Taylor". the Guardian. Retrieved 25 November 2018. ^ Cobain, Ian (24 July 2018). "'Subversive' civil servants secretly blacklisted under Thatcher". the Guardian. Retrieved 25 November 2018. ^ Cobain, Ian; MacAskill, Ewen (25 July 2018). "Labour: government must say if blacklists are still in place". the Guardian. Retrieved 25 November 2018. Wikimedia Commons has media related to The National Archives (United Kingdom). Fenton, Ben (2 July 2005). "Files on Himmler 'murder' exposed as fake". The Daily Telegraph. "Forged documents – investigation findings released" (Press release). The National Archives. 3 May 2008. Archived from the original on 10 April 2012. This page was last edited on 21 April 2019, at 09:24 (UTC).